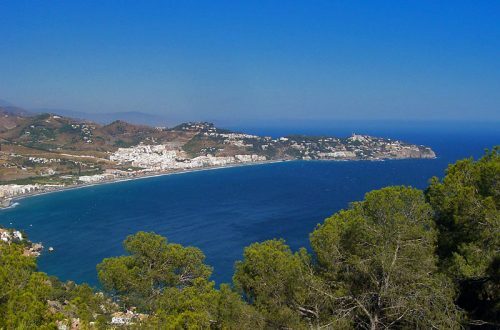 Sitting on top of a hill at the mouth of two rivers together with its neighbour La Herradura on Andalucia’s Costa Tropical, Almunecar is the perfect place to escape the crowds and have a relaxing holiday under the Spanish sun. Originally settled by Phoenician traders some 3,000 years ago and later occupied by the Romans, Visigoths and Moors. 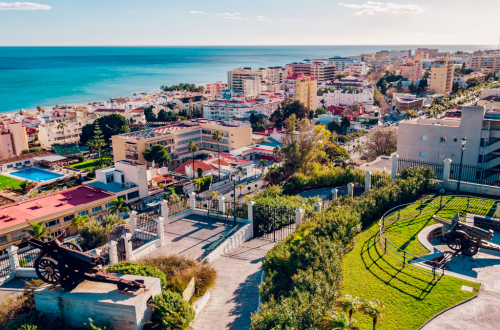 Almunecar was retaken by the Catholic Monarchs during the Reconquista and is today a thriving town of 27,000 inhabitants. Throughout the town, there are many architectural structures and monuments depicting the town’s history. Granted by King Carlos I in 1526 Almunecar’s coat of arms portrays the turbaned heads of three Barbary pirates floating in the sea following the defeat of a Berber raiding party. With medieval winding streets that lead to the Plaza de Constitución, and the old Barrio San Miguel, it’s easy to get lost in a labyrinth of narrow passageways. Sunny plazas and baskets filled with geraniums are everywhere you wander adding to Almunecar’s charm as a traditional Andalucian coastal village. Mostly pedestrianized, it is around the Plaza de la Constitución where you will find the places of most interest, which include two churches the Cultural Centre and the archaeological museum. Once the start of the main road to Granada, the Carrera de la Concepción is a busy avenue along which you can discover what remains of a Roman aqueduct and baths. 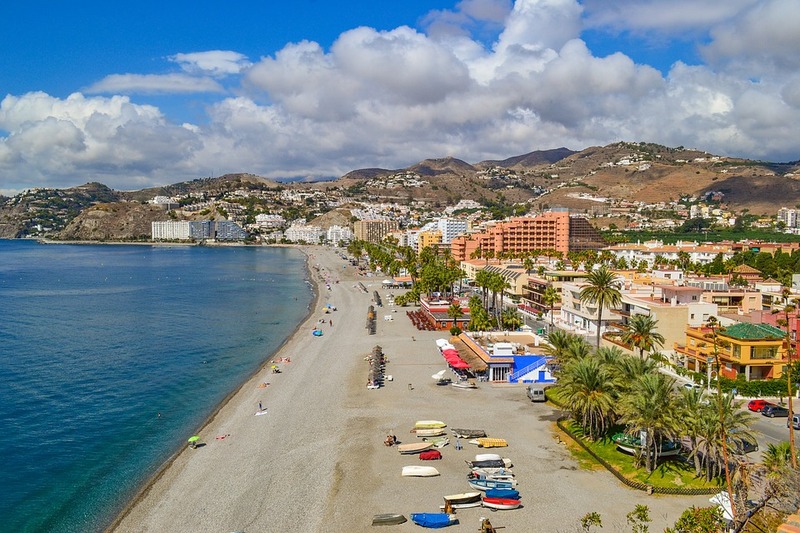 The main beach in town is the Playa Puerta del Mar and its attractive palm lined promenade where you will find several banks but unfortunately no place to park during the summer. The local coastline has 25 beaches that consist of tiny hidden coves and long stretches of sand and pebbles. The main Puerta del Mar beach has all the facilities you would expect to find on any urban Spanish beach. Countless opportunities for water sports are available, as is the chance to go snorkelling or diving in a protected marine reserve teaming with sea life. Playa San Cristobal has to be the best beach in Almunecar. In fact it’s our favourite beach in Granada province! The paseo or promenade of Playa San Christobel from the the rocks goes all of the way to Cortobo Playa and is a lovely flat and very enjoyable walk. Why not take a stroll morning or early evening? There is plenty of open space to go around for a picnic or pitching your parasol. Originally built on Roman foundations the town’s Moorish castle is its standout attraction together with the archaeological museum where you can learn all about the areas rich history that includes a 3,500-year-old Egyptian vase. Basking in the shade of the castle is a lovely botanical garden full of exotic plants and what remains of an old Roman salting pit. Numerous outdoor activities can be found inland that includes a hike up the Rio Seco to Peña Escrita Park, where you can go horseback riding surrounded by spectacular scenery. Andalucia is, of course, famous for its white villages with the picturesque Moorish village of Salobreña just up the road from Almunecar. You don’t need to worry if you have a picky eater in tow as Almunecar has a wonderful selection of quality restaurants to suit all tastes be it traditional Spanish or international cuisines. El Chaleco is a superb restaurant if you need somewhere a little different such as for a special occasion. El Chaleco is an excellent French style haute cuisine restaurant yet in a great Spanish environment. Booking here is recommended as its a small environment yet big on atmosphere. 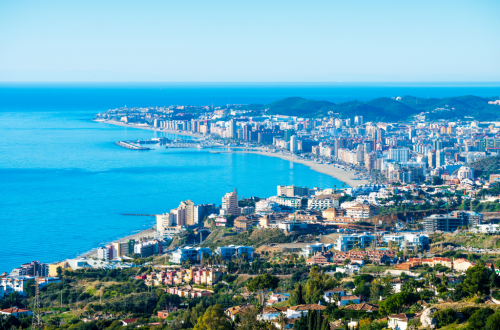 There are many bars and pubs to cater for all nationalities and budgets and there’s the usual pizzaria’s, chinese and of course some fantastic Spanish restaurants such as Nuevo Arenas. Why not try peppers stuffed with seafood to start and rosada (kingklip) as a main course, both of which are mouth watering and moreish. You may prefer the perfectly cooked lemon sole or other delights from the à la carte menu. Taking its name from the sub-tropical climate that surrounds it, the Costa Tropical enjoys days of endless summer sunshine, warm winters and an average temperature of around 20C. Snow and ice is normally unheard of here (unless your up the mountain), and sunbathing in winter is a common sight.